Burnt was not a movie I was planning on seeing — being a flick about cooking it was really not something I wanted to check out. But with few choices this weekend and Bradley Cooper being the lead in the film, why not? Do not go in this movie hungry because there are some tasty dishes and scenes that will make you even more hungrier. 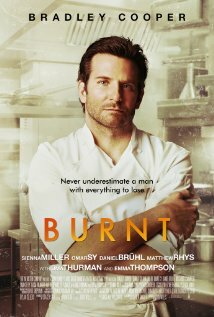 In Burnt, Cooper plays a head chef in London struggling to start fresh and make it back to the top. To some, he is so popular that he is compared to the Rolling Stones of cooking and other references name him a Luke Skywalker or even Yoda of Culinary Arts. Although he's a big deal, Adam Jones (Cooper) was not always the nicest guy. We follow him return to London after events that didn't exactly go right previously in Paris. Adam was in a bad shape with addictions that took over his life and his career as a chef, and now he is determined to come back, rebuild the relationships he ruined in Paris and regain trust he severed along the way. Cooper does a commendable job portraying this character's emotional journey. Not only do we see the life of a chef, it also made me realize that cooking can be an art. Another thing that was portrayed was the head chef's power in the kitchen. Whatever a chef says, you do it and you never talk back. Needless to say working for a chef is not a job I'd like. The supporting cast was a group of old friends Adam screwed over in Paris then hires as his crew for the new restaurant he plans to start. With a little convincing, they all agree and strive to be one of the best places to eat in London. Another person he recruits Helene, played by Sienna Miller. She played Bradley Cooper's wife in American Sniper and is something of a love interest again in Burnt but all professional in the kitchen. Helene is a struggling single mom trying to balance her daughter with a career as a top chef. Other characters are of great help to Adam — you see old friends take him back, betrayal and even some enemies that might not be after all. Bradley Cooper did an even better job in Burnt than Silver Linings Playbook. I will be surprised if he does not get an Oscar nomination for this role. This movie did not drag for a second and I can see myself watching it again. You will not be disappointed.